Curse you, your engrossing narrative, and your cliffhanger endings!!! This why I don't get into books until the series is ended. Now I am stuck waiting until the next release. I have always considered myself a fan of the political thriller such as Tom Clancy, David Baldacci, and Kyle Mills, but I have definitely found an inroad to the science fiction realm.To say that I have enjoyed these books would be an understatement. I particularly enjoy the paths that remain just one step removed, but on a galactic level. I can't wait for the next one (which will be out in the Spring of 2014 according to a message from the author :-) ). I can't wait to see how the global cooling attack is overcome. I can't wait to see how the humans take to having a double jointed Narlav on their team. I can't wait to see how mankind adjusts to the technological advances that this interaction provides.I can't wait! I can't wait! I can't wait!!!!! Thorby Rudbek - Thorby Rudbek has spent most of his life ensuring ionizing radiation safety for governments, health providers and energy companies in the West and the Middle East. He began by making radar and microwave circuitry for fighter jets. His relocations make him feel less focused on his nationality, and more like he is a Citizen of the Planet.The "Galactic Citadel" series, begun in "Ascent", is about seemingly ordinary folks who find themselves tasked with extraordinary challenges. They might seem to harken from an earlier time, when heroes were really heroes, and the only wars worth fighting were ones which would protect the defenceless. "Passage" is the second in the "Galactic Citadel" series about the mysterious girl from Arshonnan stock, the boy from Boston, and the Narlavs. Thorby's stories are fast-moving, feel-good SF adventures - with a bit of romance - that centre around real heroes with old-fashioned values and morals. 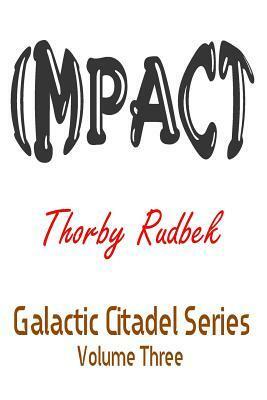 The series continues with "Impact", the third episode in this series and "Cavalry" following later.